Diarmid Campbell, senior teaching associate at the University of Cambridge, spent almost two decades as a commercial video game developer for Computer Artworks and Sony. He's now turning his attention to video games that encourage students to study engineering. Campbell's first educational endeavor, Wired, teaches the basic concepts of electric circuits, including flow, voltage, current, resistance and series/parallel circuits. The free game can be downloaded or played online in a browser. Engineering.com takes a look at the game from three perspectives: electrical, pedagogical and recreational. Wired is a role-playing game whose protagonist, a young woman, arrives at the home of an eccentric professor. At his house, she's greeted by a video screen at the front gate, where the professor tells her to follow the path around the building to the back entrance. The building itself is an abandoned school. He warns her not to go inside the school or she "may never get out." Following the path, she falls into a hole and lands in the basement of the school. Her objective is to get through the maze and reach the professor's flat. To do so, she'll need the help of several electrical machines that move the building’s walls in and out of the way. The plot is obviously unrealistic, but in the video game world, where a very popular title involved two Brooklyn plumbers who rescue a princess from a mushroom kingdom, suspension of disbelief is par for the course. Wired does a good job of introducing electrical concepts through short videos that explain principles like current flow, power sources, complete circuits, voltage, and resistance. In the first task, the player is instructed to wire a fuel cell to itself, creating a short circuit. The video then explains what a short circuit is, why it's bad, and tells the player to "never do that again" and to disconnect it. The next challenge involves moving a wall that's connected to a motor. 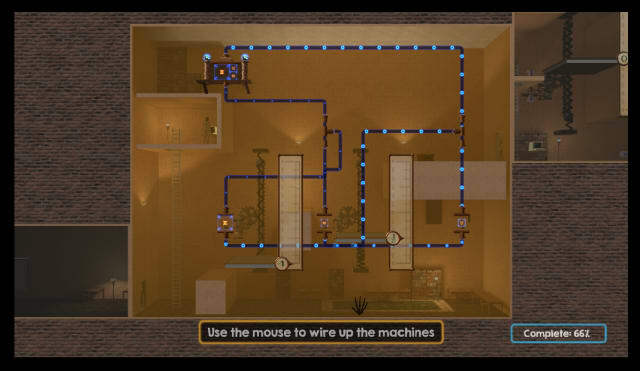 In this task, the player simply connects wires from the power source to the motor in order to make a complete circuit. The wall moves, the player reaches the other side and finds another challenge. As the game moves along, the wiring gets more complicated. Sometimes it takes more than one machine to perform the task. Other challenges introduce series and parallel wiring. Videos and demonstrations show how voltage is divided when two motors are placed in series, as well as how current is divided between two loads in parallel. A later challenge requires the player to move a wall a certain amount, but not all the way. In addition to the weight of the wall, there's another mechanical resistance—a spring—that the motor must overcome. One or more series resistors can be wired into the circuit to control the motor's power, allowing it to spin just enough to compress the spring while moving the wall to the correct position. From an electrical engineering standpoint, the concepts in Wired are presented accurately, although they are perhaps a bit oversimplified. Still, it could spark a little interest in engineering, and that's the point of the game in the first place. If B. F. Skinner and Lev Vygotsky were alive today, they might be collaborating on educational video games. Skinner's method of "Programmed Learning" presents each new concept in a small chunk, asks the learner to demonstrate their knowledge of that information, after which point the student either moves on to slightly more difficult material or receives remedial instruction. Vygotsky's "Zone of Proximal Development" is defined as the distance between what a student can learn on their own and what they can learn with a bit of guidance. In short, learning should be presented as a series of challenges, with each one being difficult enough to hold the student's interest but not so arduous that the learner becomes frustrated and quits. Pedagogically, Wired does a good job of presenting the necessary information in an easy-to-understand format and asking the student to use their newly acquired knowledge to solve a "realistic" problem. One thing that's lacking, however, is remediation. If the student gets stuck on a problem or wires a circuit incorrectly, there's nothing in the game that offers suggestions. This is the one shortcoming that I found; hopefully it will be addressed in a later version. I'd rate this game a 2.5 out of 4. It was a fun puzzle platformer with interesting mechanics. The deeper plot was unexpected from an "edutainment" game, a genre infamous for failing to connect with audiences, and the puzzle sections, while falling short of the greats like Portal, were competently designed. There was some repetition in puzzle solutions, though. Each puzzle in a game should teach a new mechanic or use an old one in a new way. Sometimes, Wired ends up teaching the same lesson several times in a row. The graphical quality was strangely poor, too. With such competent game design, one would expect more work put into presentation but it looks like most of the assets were free models found in under an hour. The player character had solid animations, but low-resolution textures. Not all of the assets have this problem, just the ones you'll notice. It was just challenging enough to hold my attention (for the most part) but sometimes dragged on due to the previously mentioned repetition. The controls and navigation are fairly standard for 2D platformer games. If you can play those, you'll have no trouble with this. It was very easy, in a good way. Understanding the game isn't supposed to be difficult, so I consider this one perfectly fine in that regard. The electrical concepts were fairly well explained, up until parallel wiring was introduced. The "stacking boxes" puzzles were fine by themselves, but their integration into the main puzzles could have used more work. At 66% of the way through, I encountered a seemingly impossible puzzle. Even my Dad (an electronics engineer) couldn't solve it. The game taught about flow, voltage, and wiring in series vs. parallel. Flow is just what it sounds like, the direction of the current through the wires. It is similar to water flowing through a pipe. Voltage is the strength of the electricity, sort of. The higher the voltage given to the machines of the game, the better they work. Wiring in series splits the voltage between each machine wired up, making them a fraction as powerful. Wiring in parallel gives each machine full voltage. The game had a good flow, with some brain-teasing puzzles. It interrupts them via live-action videos, but those can be skipped. I probably sat through fewer than half of them and still got the concepts. Although I could only get 66% of the way through (due to the impossible puzzle), this was a good game for learning electronic principles. As Joe mentioned, some of the videos can be skipped. In fact, not all of the videos present useful information; some are just part of a storyline about the building (an abandoned school) and its history. I can't say that those videos add anything useful or interesting to the game. At best, they may offer a brief respite from the challenges, allowing the student to recharge for a bit before moving onto more difficult material. In my three decades of classroom experience coupled with graduate studies in educational technology, I've become aware that emotion is the gatekeeper of the intellect. Students will go through all kinds of academic hardships (like physics and calculus) if they're excited about where they can lead. Presenting the fun side of engineering very early in a student’s education is a great way to instill a passion for the field, which makes the tough courses a little easier to handle. In that respect, Wired does its job. I hope more game designers follow suit.